In his article in Daily Maverick, Adam Habib takes to branding the EFF with derogatory terms rather than engaging its policy proposals, methods of protest and philosophies substantively. By SINAWO THAMBO. On 13 March 2018 the Vice Chancellor of The University of Witwatersrand, Adam Habib, wrote what was an underwhelming critique of the Economic Freedom Fighters, and an exaggerated appreciation of newly elected President Cyril Ramaphosa. Habib, unsurprisingly is caught up in the liberal media frenzy of being starry-eyed by the faux “New Dawn” that is purported by the rise of Cyril Ramaphosa, and the backlash that is organised by the liberal press and academics alike to the successful motion on land expropriation without compensation, along with the EFF’s posture as a leftist organisation in general. He in fact dismisses that and goes as far as saying that the EFF is proto-fascist. After reading the article I decided to write a response because of how necessary it is to debunk populist media propaganda that is not interested in fundamental change in South Africa. First, the need to dispel the notion of Cyril Ramaphosa being a tactful and upright president since his election to office, and second, the need to defend leftist ideals and policy perspectives from the lazy arguments of impracticality and radical philosophies from being framed as fascist. Habib starts off by somewhat lauding Cyril Ramaphosa’s managing of the transition from the Zuma regime. This from the onset does away with any notion that Cyril Ramaphosa is, firstly, anti-corruption, but second, that a new dawn has set upon South Africa under his leadership. The continuity Habib speaks of and appeasement of party factions simply means that South Africans are stuck with the remnants of the rot of the Zuma regime for the sake of political expediency within the ANC. It means the faction that consists of Minister of Home Affairs Malusi Gigaba has been appeased, of Bathabile Dlamini, of Nomvula Mokonyoane, of Lindiwe Zulu, Faith Muthambi. These are some of the individuals who are benefactors to the supposed tact of Cyril Ramaphosa, all haunted by scandals of the previous regime relating to State Capture. This shows Ramaphosa as not being consistent to his anti-corruption message but also to be an indecisive leader. His mediator qualities are what Habib also seems to advocate for even when it comes to altering socio-economic relations in South Africa. Typical of him in our experience as student activists, he takes to branding the EFF with derogatory terms rather than engaging its policy proposals, methods of protest and philosophies substantively. He writes that “the EFF is similarly redefining its raison d’état. But addicted as it is to political spectacle, it has become even more prone to a political populism that incites racism, advocates extreme policies outside any evidential base, and creates a militaristic, violent, nihilistic macho-culture. Its strategies and tactics also skirt the very margins of the law – coming close to the advocating of hate speech, threatening individuals, thrashing businesses, violating the rule of law”. Habib suffers from what many white South Africans and black liberals alike do in this country. A failure of engaging the policy positions of the EFF. The EFF has always had in place firm policies that are anti the status quo. They range from land expropriation without compensation and the nationalisation of mines and banks to other key sectors of the economy, free education and healthcare. The EFF has always been an anti-racist, anti-imperialist organisation that manifests itself in the following ways: As a political party that preoccupies itself with influencing legislation in accordance to its ideological outlook; a protest movement that makes relevant interventions in society in the form of mass demonstrations, and as a civic movement that makes tactical alliances with others to address particular issues at hand in the country and the world. At a tactical level it utilises leaders in the black school of thought when it relates to responses to structural violence. With the racist H&M advert and Höerskool Overvaal incidents, the EFF responds with a necessary urgency, contrary to the ANC which does not respond at all. The ANC’s incompetency in addressing issues of race vigorously is also what Habib seems to appreciate, failing again to understand that black South Africans respond from a point of oppression and that their response should not be determined by those who enact the oppression as per Steve Biko. Habib seems to be under the impression that everyone can respond by writing an article on oppressive norms, and does not understand the tactical nuances of peaceful protest and radical interventions. The “proto-fascist” nature of this was not outlined but rather used to serve an alarmist purpose towards progressive and unconventional thought. We can then conclude that the mistake made by liberals like Habib is that they fell so in love with the EFF during the Zuma period due to its stance against corruption that they forget that the EFF is essentially on the left politically with core principals and programmes, of which Zuma was never one. The vulgarity he then uses comes from a place of awe and lack of engaging its policy perspectives. 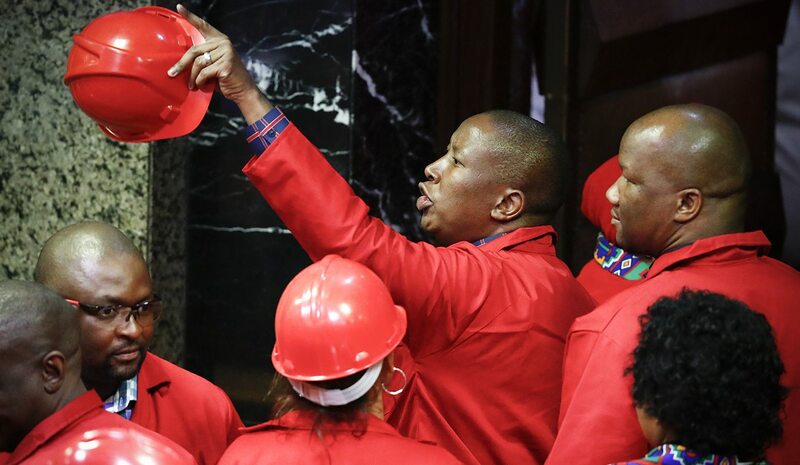 He argues that the policies of the EFF have no evidential base, which is – if we look at other countries that have implemented some of the EFF’s policy objectives and controlled the wealth of the country – inaccurate. It was in Burkina Faso under the leadership of Thomas Sankara where land and mineral wealth was nationalised; subsequently wheat production rose in three years from 1,700 kg per hectare to 3,800 kg per hectare, making the country food self-sufficient and its banks independent from loan schemes from the West. It was in Libya where Colonel Muammar Gaddafi provided free education and healthcare for his citizens, with the literacy rising from 25% to 87% under his regime. It was in Libya where the land was controlled by the state; a citizen would be allocated a farm, seed product and a home should they apply. It was in Cuba where Fidel Castro ensured universal access to healthcare and education, improving literacy rapidly between 1960 and 2007. Cuba remains a leading provider of healthcare in Latin America. First, it is ironic that all these leaders at some point or another were either deemed dictators or fascists by liberals, the right and the West, same as the current branding of the EFF. Second, it is utterly baseless to claim that the policies espoused by the EFF are extremist and lack an evidential base. History shows us otherwise. They are currently not feasible under the liberal capitalist framework we exist in in South Africa and due to the patterns of ownership in South Africa with regards to land, mines, banks and other key sectors. The sophisticated exploitative nature of the current capitalist system is what academics, scholars and thinkers of society should be concerning themselves with. What is the standard of living under the current economic system? What are the alternatives provided by Habib to the current framework and his guidelines for redistributing wealth and land in South Africa to the ones that have obviously failed if one considers the poverty rate which stands at 55.5%, and a broad unemployment rate which stands at 35.1%? What is the plan for redistributing the 72% of land which is currently in white ownership? What is their solution to addressing the inadequacy of the willing buyer, willing seller principle, philosophically and practically? “This is where Ramaphosa’s ANC needs to advocate a coherent programmatic agenda to address the exclusionary character of South Africa’s contemporary political economy. It needs to clarify how it can correct for the state’s institutional failures to redistribute land, or to grow the economy in an inclusionary manner so that it not only increases employment, but also reduces inequality and poverty simultaneously. It needs to programmatically demonstrate how justice can be part of a reconciliation agenda or how the building of a cosmopolitan nation can simultaneously be compatible with our collective African-ness coming to the fore”. In a nutshell, Habib is suggesting that the ANC do what it has been doing over the past 24 years with regards to restructuring the South African economy. This is to brainstorm ways in which social reform can be enacted without unsettling the fragile race and reconciliation relations in South Africa. An act which is not possible if one seeks to make fundamental change, and an act that has sustained the current position of black people within South African society. The lack of a plan is further emphasised by the campaign by the leadership of the ANC canvassing for the return of Julius Malema to the ANC. This not only confirms that the ANC is an organisation that has lost imagination, but that there is no one in its ranks, even its president, who has been able to form a collective that can capture the imagination of our people with sound radical policy on socio-economic change. I would urge Adam Habib to read the policies and principles of the Economic Freedom Fighters. It cannot be that a Vice Chancellor of an institution of higher learning, a place that centres itself on knowledge production and critical thinking, can produce such a feeble critique. I won’t dilly-dally on how the card-carrying member status of Adam Habib as a member of the Congress Movement reared its ugly head in his uninspiring piece. I will also not spend too much time on debunking his conceptualisation of Killmonger as a radical activist who was not merely seeking revenge in the Black Panther movie, but understanding that even in our current contemporary epoch, black people are still under siege in the United States, France, parts of Eastern Europe and frankly all across the world, and how this necessitates a radical response. His infatuation with T’Challa’s reformist approach to a structural problem is hardly surprising.